During summertime, most of the workers working at constructions sites or any other outdoor operations are exposed to extreme heat direct from the sun, high air temperatures and high humidity and this will increase the risk of heat-related illness. The most common symptoms of heat stress are Dehydration, Fainting, Headache, Fatigue, Dizziness, Muscle Cramps and Nausea and the most serious disorder associated with heat stress is the HEAT STROKE. Heat stroke shall require immediate action and medical attention because the same can result in fatal or death. Provide proper ventilation, air conditioning and cooling fans on the working area. Must have an emergency plan (specifying what action to be done if a worker has signs of heat stress) and medical service available and ready. Provide adequate potable water (for drinking purpose only) close to the vicinity or working area. Wear light colored, loose fitting and breathable clothing such as cotton. For heavy work task - schedule on early start or during the coolest part of the day. Take more breaks in extreme heat and humidity for about 5 to 10 minutes break every hour. During breaks, take rest on a shaded area or cool area whenever possible. 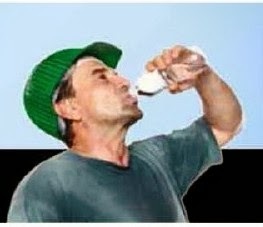 Each worker is required to bring him always a bottle or container full of water to drink throughout the working day. Drink small amount of water frequently so you won't become thirsty. Monitor each others physical condition (e.g you and your co-workers) for symptoms or signs of heat-related illness and if anyone who is developing or affected, give immediately attention and first aid. "ACTING QUICKLY CAN SAVE LIVES!!!" A group of scaffolders was given a task to dismantle a scaffolding erected site. They use the so-called "hand ball" method, where ledgers are dismantled at the top and passed it downwards from level to level using a division of labors. 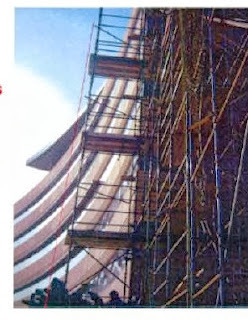 While performing the hand ball method, unexpectedly, one ledger slept on one of the scaffholder's hand from a certain level but the scaffolder who was positioned below quickly catch the ledger to avoid accident. Luckily, no injury was reported. I do not owned the photo shown above and the same is for illustration purpose only. Maintained proper communication throughout the tasks. Ensure correct manual handling of materials are to be followed accordingly as the same to be highlighted in discussion on toolbox talks to the assigned workers. Update the risk assessment regularly or as needed or as required and clearly highlight or mentioned the hazards and safety measures to be taken to ensure the system of work is safe. As per the code of practice for dismantling of scaffolding, all materials shall be lowered carefully by passing it from one scaffolder to another. Do not throw the materials directly to the ground it is an unsafe practice. Ensure sufficient number of operatives are provided for the task and must be trained and competent persons, instead of attempting to complete the job with less workforce and incompetent. Don't forget also that the public shall be protected at all times (if required depending on the type and location of the project) by barricading or providing barriers around the areas where scaffolding is dismantled. A worker was injured while cutting the top off of the drum using an angle grinder ignited flammable vapors within the drum. The explosion within the drum causing the bottom to separate and the remainder was driven upwards that struck the worker. This was a high potential or high risk incident which could have resulted fatality. Risk assessments should be carried out and safe methods of carrying out the task must be discussed and implemented. Supervisors must be trained and need more training if necessary in order to identify or distinguish high potential risks. Chemical containers/drums or any other type of containers that will be re-used for another purpose MUST be thoroughly rinsed to remove all residual products. 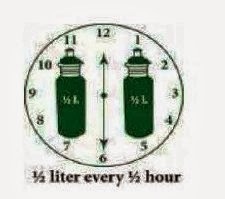 Water soluble products can be rinsed by filling and emptying the drum with water three times. Products that are not soluble in water, such as petroleum, will require solvent or detergent in order to remove the product. If hot work such as grinding, cutting, welding is to be performed on a container or drum that contains a flammable material, the atmosphere within the drum must be tested in accordance with local regulatory requirements. A combustible gas meter shall be used as a minimum requirement to ensure that a flammable atmosphere is not present or does not exist. In case a flammable atmosphere is present, the drum shall be filled with water and then let it drained to remove the flammable vapors and the atmosphere must be re-tested. Never cut into a sealed drum or container. Ensure drum caps are removed.